If you're interested in deer-tick control, then you should be seeking deer-resistant plants for your landscaping. Not only will this step help control those hoofed marauders, but it is also critical for Lyme disease prevention. The use of such plants supplements repellents, fencing, noise-makers, and other gadgets, such as the Scarecrow Sprinkler designed to keep Bambi away, and of course, spraying to kill ticks. Keeping Bambi out of the yard has been important to gardeners for a long time. Deer damage to plants can be costly. But when Lyme disease came along, the problem was elevated to a higher level of importance. It has now become a health matter, not just a financial matter. There's a greater need now to keep deer ticks away than to keep Bambi away, per se (although controlling the latter helps control the former, too, so you're killing two birds with one stone). Doing so could save you much more now than just money: if you practice effective deer-tick control, it could save you from some awful health problems. Although a hungry Bambi will be drawn to almost any plant, the landscaper's best long-term option may well lie in a landscape plan that prescribes deer-proof plants. Simply planting what Bambi usually disdains to eat may not seem as strong a deer-proofing measure as surrounding your property with fencing, I admit. But then again, building a fortress around your property has severe aesthetic drawbacks. By contrast, deer-proof plants can be every bit as attractive as the specimens you currently grow in your landscape. Deer-proof plants are also a heck of a lot less expensive than fences. If your attitude is, "I just let Bambi come in and munch away; I enjoy viewing wildlife," please be aware that you may have to adjust your lifestyle accordingly. This pest, however cute, can harbor the deer ticks that carry Lyme disease. The more they come to graze on your property, the greater the chances of you encountering the disease-bearing ticks. So if you're not going to practice effective deer-tick control, at least take the proper precautions to prevent contracting Lyme disease. One such precaution is to check your body thoroughly for the presence of ticks when coming in after being out in the yard. Deer ticks, in particular, are so small that you can't rely on the presence of pain as an indicator that you've been bitten. But even in the case of other types of ticks, most victims are not immediately aware of it when they've been bitten by a tick. In addition to scanning your own body for ticks, you'll have to check the bodies of your dogs and cats. The ticks, by the way, are only the carriers of the disease. The true culprit is a spirochete bacteria, Borrelia burgdorferi, which is transmitted to wild animals, farm animals, cats, dogs and humans through tick bites. Lyme disease is named after the town of Lyme, Connecticut (U.S.). Lyme disease burst upon the scene in 1977 when arthritis was found in a number of children in the vicinity of that charming town on the banks of the Connecticut River. One particular tick, Ixodes scapularis (also sometimes given as Ixodes dammini), commonly called the "deer tick," is the type of tick responsible for the majority of cases of Lyme disease in the northeastern United States (the birthplace of Lyme disease), but other types of ticks are carriers in other regions. There are three stages in this tick's life cycle: larva, nymph and adult. In both the larval stage and the nymphal stage, their favorite host is the white-footed mouse. It is the adult ticks that feed on Bambi's lot. But they use a different host at each stage of their life cycle. If you're concerned about catching Lyme disease but don't want to go through the annoyance of scouring yourself from head to foot daily, checking for ticks, the logical choice is to try to keep Bambi away. One way to achieve this is to stick with a landscape plan consisting of deer-proof plants–specimens that Bambi doesn't find appetizing. So you'd like to use deer-resistant plants, perhaps in a garden border that includes ornamental grasses? But you're looking for a landscape design plan in which to incorporate them effectively? The present page suggests and describes one possible landscape plan of deer-resistant ornamental grasses and other plants. The plants in this landscape plan are arranged along a fence to decorate a border area in a sunny area in your yard. The landscape plan I'm suggesting is composed of three rows, with the tallest plants (a shrub and tall ornamental grasses) in the back row. The shortest plants (groundcovers) will populate the front row of the landscape plan, while those of medium height will reside in the middle row. Northern sea oats (Chasmanthium latifolium) is an ornamental grass that grows 24"-36" high in loose clumps of green foliage (for a picture of this plant, see photo above). Its name derives from its seed pods, which look like oats. 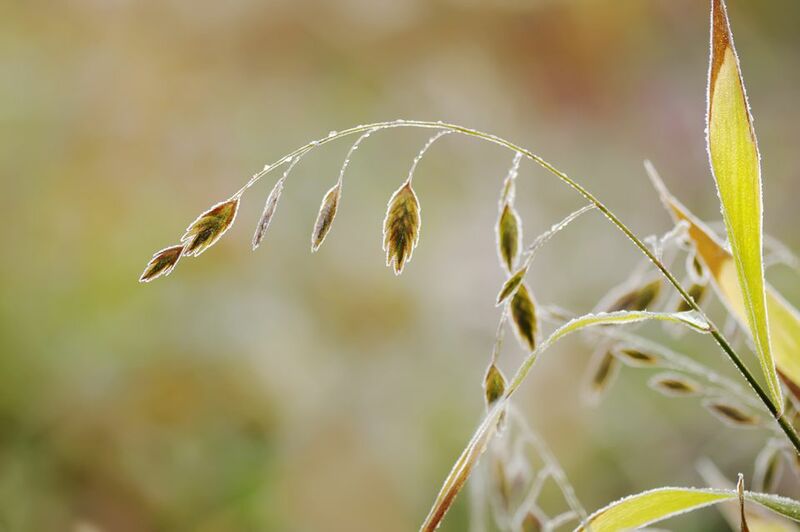 This deer-resistant ornamental grass is cold hardy to zone 5. Ornamental grasses, even after their leaves have dried and died, provide visual interest to the winter landscape. Red osier dogwood (Cornus sericea 'Allemans') puts out white flowers in May that are followed by white berries. But deer-resistant red osier dogwood is grown primarily because of its bark, which ranges in color from red to burgundy. Its height is 6'-10', its spread 5'-10'. A patch of fiery red osier dogwood against a backdrop of pristine snow makes for an unforgettable winter scene. Zones 3-8. English lavender (Lavandula angustifolia) is considered by humans to be an aromatic herb (for a picture of this plant, see photo on Page 1). But deer don't seem to concur; they don't care much to eat it, at least. This perennial can be grown in zones 5-8. Traditionally lavender has been cut, dried and placed in linen closets, making good use of its pleasing aroma. Like most herbs, lavender needs a well-drained soil. Reaching approximately 2' x 2' at maturity, this intermediate-sized plant will fit nicely into the middle row of this deer-resistant border. Yarrow plants (Achillea) are herbaceous perennials grown in zones 3-8 in well-drained soils. Yarrow plants come in a variety of colors, including the white yarrow we see in the wild, as well as the common yellow. But for something different, try the red color of "Fireland" Yarrow (Achillea 'Feuerland'), which can grow up to 3' high, with a spread of about 2' -- another plant that's the right size for the middle row of our deer-resistant planting. Most all asters are deer-resistant. "Bonnie Blue" dwarf aster (Aster novi-belgii 'Bonnie Blue') grows only 12" - 18" high, with a spread of 18". This aster grows in zones 4 - 8 in well-drained soils. Its daisy-like flowers are blue with a gold center. Bonnie Blue dwarf aster continues blooming late, providing fall color when most flowers have packed it in for the winter. To promote maximum blooming and most compact growth habit, pinch it throughout the first half of the growing season (until about mid July). Golden creeping juniper (Juniperus horizontalis 'Mother Lode') can be grown in well-drained soils in zones 3 to 9 (for a picture of this plant, see photo on Page 1). This evergreen will rise at most 1/2' off the ground, making it deserving of a front row seat. It spreads 8' - 10'. Not only is creeping juniper deer-resistant, it's also drought-tolerant. This groundcover's foliage is a striking gold, mellowing to more of a bronze in winter. Another creeping juniper that you can plant for deer control is 'Blue Rug' juniper. Do Pesticide Sprays Kill Ticks?